We set apart some time in our regular worship today to pray for our brothers and sisters in Christ who are persecuted. Using some materials (video, small booklets and power point slides) provided by Open Doors and some though-through prayers for governments, believers and their persecutors, we were able to bring their needs to our Lord. We did not pray that the persecution would end (Jesus promised that we would be persecuted because we belong to Him!) but that God would give them grace to maintain their trust in Him, their faithfulness to His word and the strength to continue to pray for their persecutors. be strengthened by the Holy Spirit (Ephesians 3:16). know how to share the gospel (Ephesians 6:19). It’s getting close to be that time of the year again! No…not Christmas…(well not just yet anyway), but it’s almost time for our annual Playgroups and Sunday School celebration service on Sunday November 25th @10:30am with a shared lunch to follow… Word is out that ‘Hot Dog’ is planning to be there too! Come and join us! 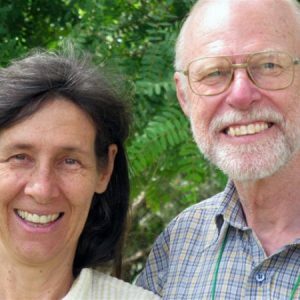 Based in Uganda, Rhys & Rhondda Hall are long term Australian missionaries who serve with Pioneers and APWM providing a vital radio and literature ministry to the war-torn people of South Sudan. We are looking forward to their visit to some of the St John’s ministries on Saturday November 17th in the following ways; Rhys will be speaking at the Men’s Fellowship at 8am. Breakfast will be served for $5 and an RSVP is required to bendigopc@gmail.com and Rhondda will be speaking to the Ladies’ Fellowship at 10:30am over morning tea. Ladies, a plate please. 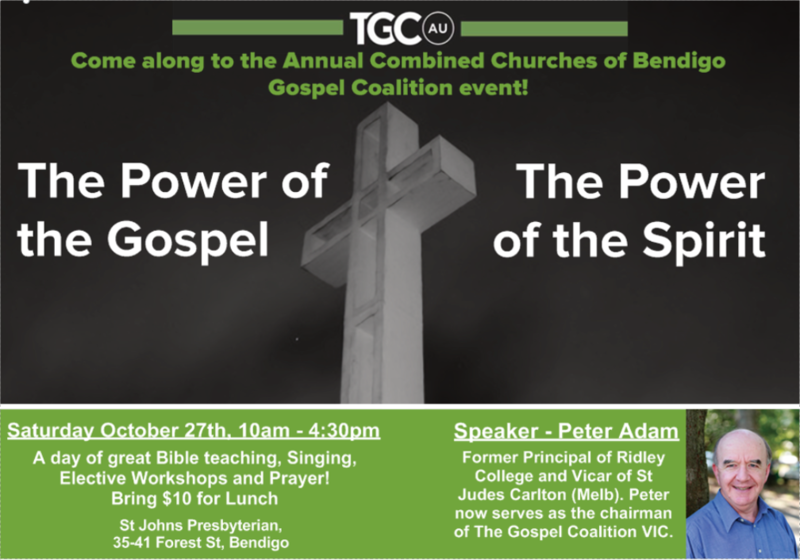 Come and hear the latest! There will be an offering for the Hall’s support at both meetings. Contact us for further details. We are so grateful to Mike for generously giving up his time to make this return visit to St John’s, having preached at our Naval Services in 2013 and then again in 2014. Thank you Mike and may God bless you in your important leadership role in the RAN. 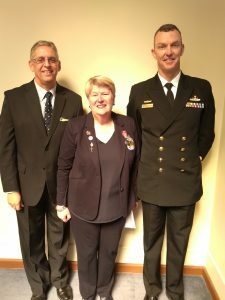 Pictured above (L-R) are Rev Philip Burns, Christine Clifford (Acting President of the Bendigo Ex-Navalmen’s Club) and Captain Mike Oborn. People are on the move. They’re fleeing war, conflict and persecution. They’re looking for work. They’ve been trafficked, abused or cast out. For any number of reasons, they are in a new place. They’re seeking a new life and their needs are many. Here in Australia, the church is on the move. As God brings new neighbours into our communities, we have the opportunity to become people of peace to them. CultureConnect is helping Australian Christians come alongside migrants to share journeys of joy and pain, faith and hope. 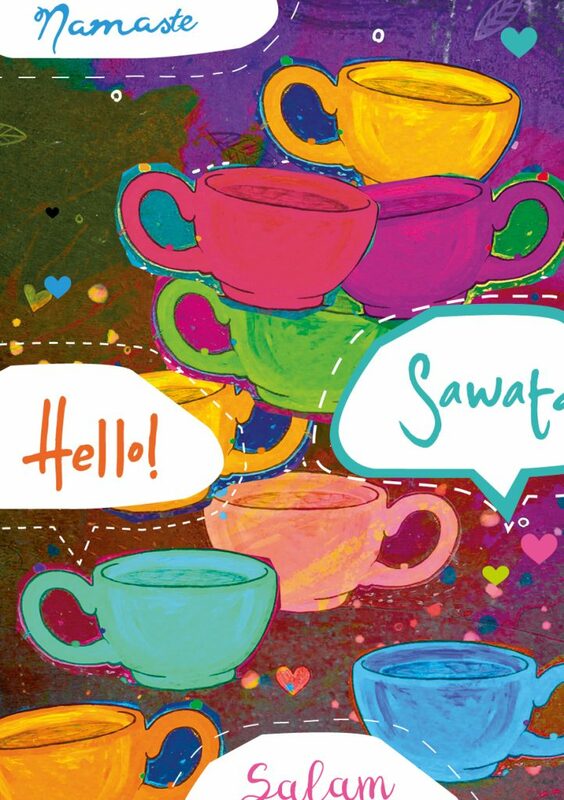 You’re invited to this special training event, where CultureConnect workers will be sharing how you can walk with those on the move in your community. So come, walk with us. Lunch and light refreshments provided. Would we be better off without Christianity? Christian history is full of violence, corruption, and oppression. So would we be better off without Christianity? Does religion poison everything? 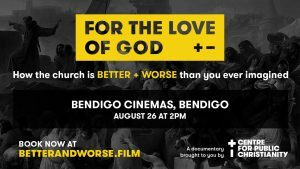 ‘For the Love of God: How the church is better and worse than you ever imagined’ is a documentary by the Centre for Public Christianity, confronting the worst of what Christians have done – and also tracing the origins of Western values like human rights, charity, humility, and non-violence back to the influence of Jesus. Click here for more information and details of how to get tickets. Our ‘daughter’ church gets her own home! 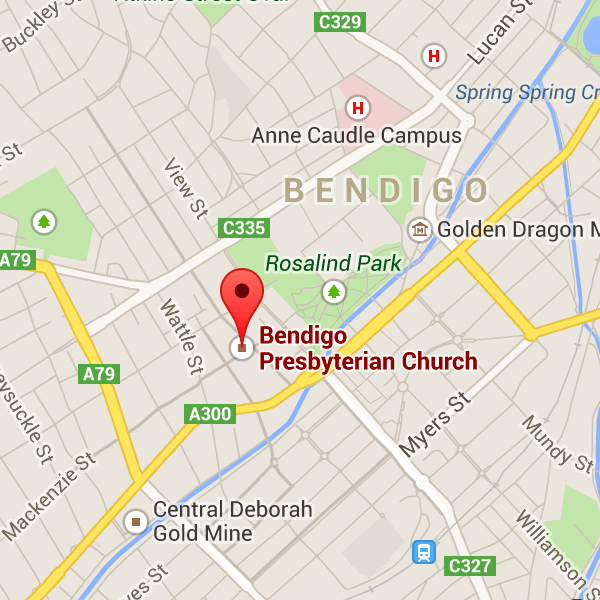 We are rejoicing with the Reforming Church congregation (South East Bendigo Presbyterian Church) who now have the keys to their new ‘home’ at 17 Victa Road, East Bendigo and begin meeting there from this Sunday August 5th at 10:30am. 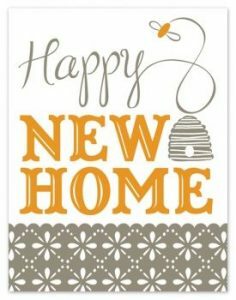 Your ‘parent church’ family is thanking God for His wonderful provision for you and praying that all who enter your ‘new digs’ may find a warm welcome and the saving grace of Jesus Christ our Lord. Want to know more? Follow this link here. One of the challenges that the 480,000 people who fled from civil war in South Sudan face as they find refuge in Ethiopian refugee camps is that they have no Bibles. They have none because they ran from their homes for their very lives! 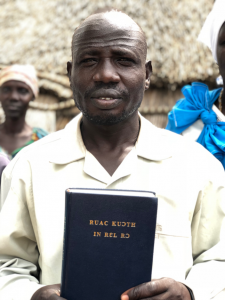 In an attempt to redress this, APWM has launched an appeal for Bibles, aiming to reach a target of 33,000 Bibles in the Nuer language at a cost of $330,000 (ie $10 per Bible)! In the last few weeks, we are pleased to have donated 123 Bibles to this appeal…small, we know, but when joined with the gifts of many other Presbyterian congregations, not an insignificant amount. Like to contribute to this appeal? Follow this link here. 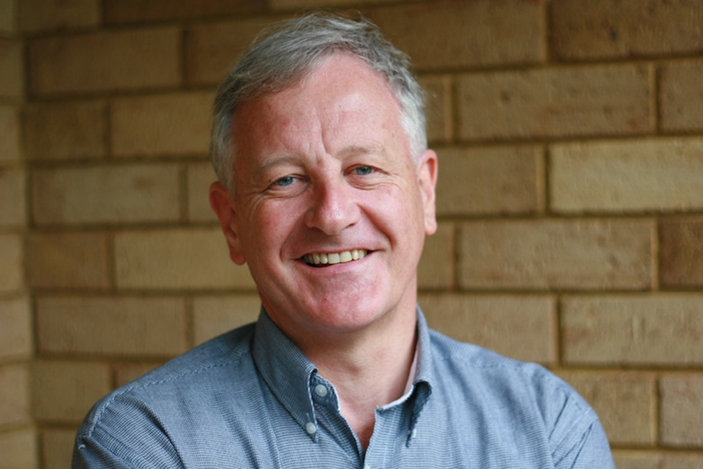 We were pleased today to be able to welcome Rev Kevin Murray, the National Director of Australian Presbyterian World Mission (APWM) to our gathering this morning. Thank you Kevin for coming and sharing God’s Word with us, encouraging us with news of how God is using APWM workers all across the globe and challenging us to be busy with the gospel at home and support those who have been called to distant places. You can read about the wider ministries of APWM here.